Here we see an Airbus A-380 spraying huge exhaust plumes in a clear blue sky with high probabilities of low relative humidity. We can use 3 observations to rule-out textbook science that says contrails are a result of water vapor as a byproduct of engine combustion. First, the beginning of the visible trail is too close to the hot engine exhaust. You’ll need to prove how a hot jet engine can eject ice crystals directly – or only inches away from a hot jet exhaust of up to 300 deg. C.
Water vapor typically remains in the vapor stage above freezing for at least 20-35 feet from the jet exhaust at cruise altitude – before it mixes with ambient air temps of -50 deg C. to condense into visible ice crystals that NASA calls “contrails”. #2, the trail from #3 engine (counting from left to right) is distinctly different in density and color compared to the plumes of the other 3 trails. With all engines performing normally this visual anomaly is not possible under textbook contrail science, since all 4 engines are inside the same column of atmosphere. Therefor, the plumes from all 4 engines should be the same in appearance. But they’re not. Some critics claim the nozzles are only drain tubes to eliminate pylon moisture. This myth may have been true in the distant past but multiple nozzles are now seen fitted to pylons with crude, after-factory workmanship to drain more than just pylon water. Remember, the military and government agencies will provide a coverup story for every covert operation they want to hide from the public. We can see the nozzles are obviously installed after the aircraft left the Airbus assembly-line since the paint is missing, the alloys are different and the crude workmanship is not to Airbus factory specifications off the assembly line. Observation #3… We see a anomalous FIFTH plume originating from somewhere in the fuselage of the aircraft. This is strong evidence that an on-board container and pump system is supplying chemicals to the nozzles. A malfunction or leak in this system could explain – both the existence of a 5th trail, and the faded discoloration of the plume from the #3 engine. It’s most apparent that the nozzle fitted above the #3 engine exhaust is partially blocked or starved so that it functions differently than the remaining 3. Observations #1 #2 and #3 are consistent with spraying from nozzles fitted to the engine pylon. A less likely explanation would involve the doping of jet fuel with chemical additives, like sulfur in order to create a chemical trail and artificial cloud that doesn’t depend on water vapor. But fuel doping doesn’t easily explain how only one engine plume is different than the remaining 3, nor does it explain the existence of a 5th mysterious plume exiting the tail of the aircraft. 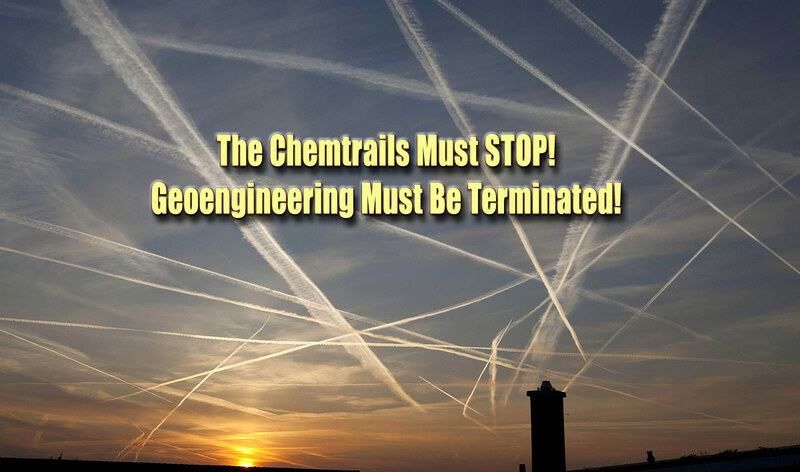 We can further verify our observations by looking at the recommendations of Geoengineer, Alan Robock at Rutgers University who wrote a paper in 2009 on “Benefits, risks, and costs of stratospheric geoengineering”. ” Options for dispersing gases from planes include the addition of sulfur to the fuel, which would release the aerosol through the exhaust system of the plane, or the attachment of a nozzle to release the sulfur from its own tank within the plane, which would be the better option. Geoengineers like David Keith and Alan Robock pretend that don’t know the military and civilian airline contractors are already spraying the troposphere with chemicals but they boldly adopt current methods for spraying sulfuric acid into the stratosphere because it’s safer, causes less wear on the fuel system and engines and allegedly doesn’t pollute the breathable air when the planes fly in the troposphere. But we all know what goes up must eventually come down as pollution we will all need to find ways to avoid.